What does it mean to live an eco-zen lifestyle? 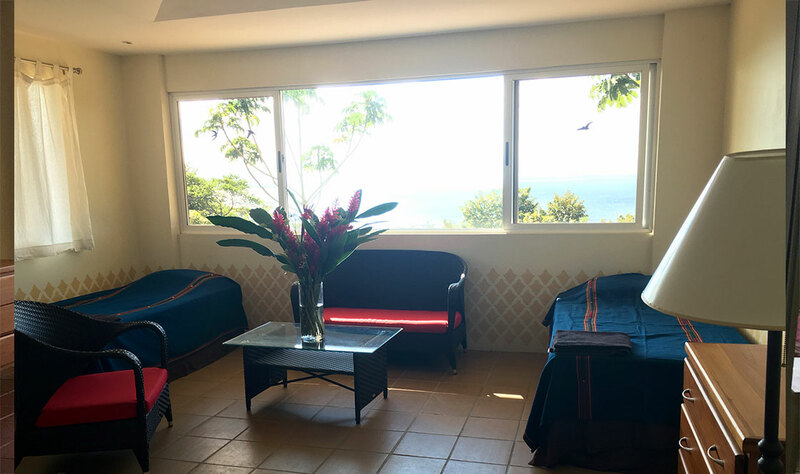 While at Pavones Yoga Center you’ll have the opportunity to live in a remote and rural part of Costa Rica and experience what life is like close to nature. When building Pavones Yoga Center, our intention was to maintain the delicate balance between modern comforts of home and the simplicity of monastic living. We furnished every bed with the best orthopedic mattresses and memory foam pillows. We installed overhead fans and bathrooms in each room for privacy. You’ll find shelves and drawers for your belongings, and a chair or couch and side table in your room — but not much else. In the spirit of a Japanese Zen monastery, we aimed for clutter free simplicity. As for the eco part of eco-zen lifestyle, we know from personal experience that time spent in the outdoors naturally opens us to feel the very real connection that we have to the natural world. We hope that you’ll join us in delighting in this connection. 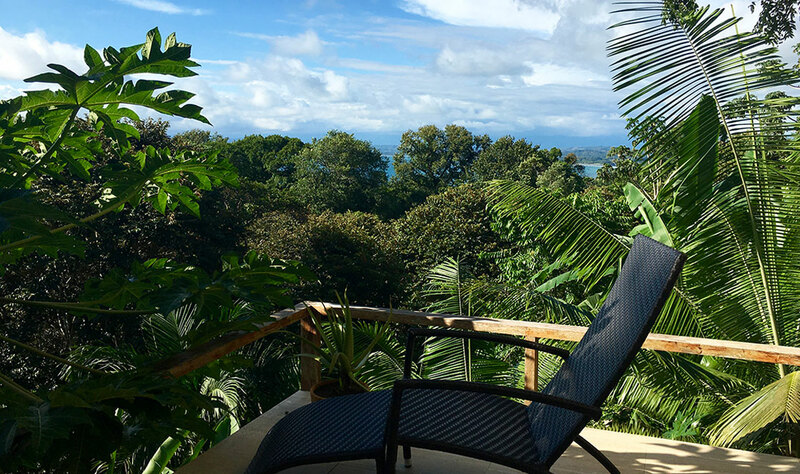 The Garden Villas at Pavones Yoga Center are equipped with full sized kitchens, open-air living/reading rooms, and extensive balconies with unsurpassed ocean views overlooking the village of Pavones and the famed local wave. These rooms are located beneath the Yoga Pavilion and thus provide almost instant access to any event at Pavones Yoga Center yoga. 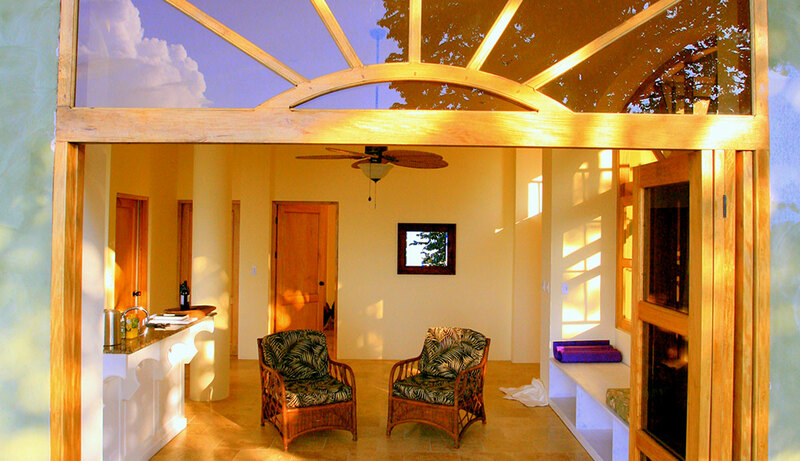 The two-bedroom, two-bath Garden Villa is available as an upgrade option during your yoga teacher training or retreat. Check our registration page for pricing and availability. 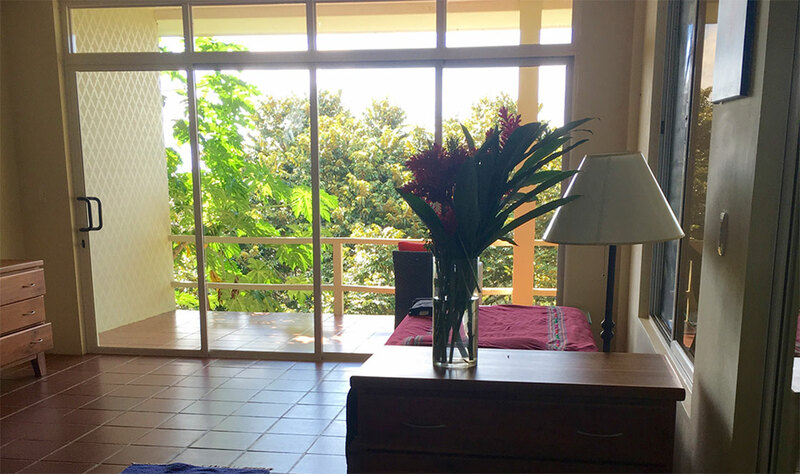 Outside of retreat dates, there is a week-long minimum stay for renting the Garden Villa. Each room has either a king-sized bed with orthopedic mattress or two twins. Air conditioning is optional although most people find the ceiling fans and large ocean-facing windows provide an ideal climate. The rooms at Pavones Yoga Center are not equipped with televisions, Wi-Fi, or telephones. We like to think of your time with us as a chance to unplug, to enter a period of digital-detox. Most people find that while the simplicity of life without modern technology may be challenging at first, there is a subtle and delicate quality of inner contentment and peace that permeates your time at Pavones Yoga Center. This is ultimately aided by slowing down to nature's schedule and would be difficult to achieve amidst the faster pace of twenty-first-century plug-in amenities. 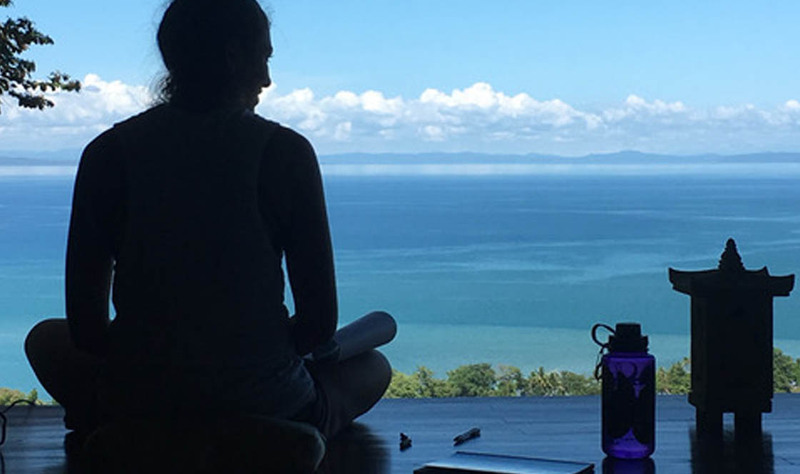 Whether you are visiting Pavones Yoga Center as a student at one of our yoga teacher training programs, or as visitor for one of our yoga retreats, Villa Pacifica (lightly termed "the yoga house" by yoga teacher training students) is likely to be your yoga home during your stay with us. 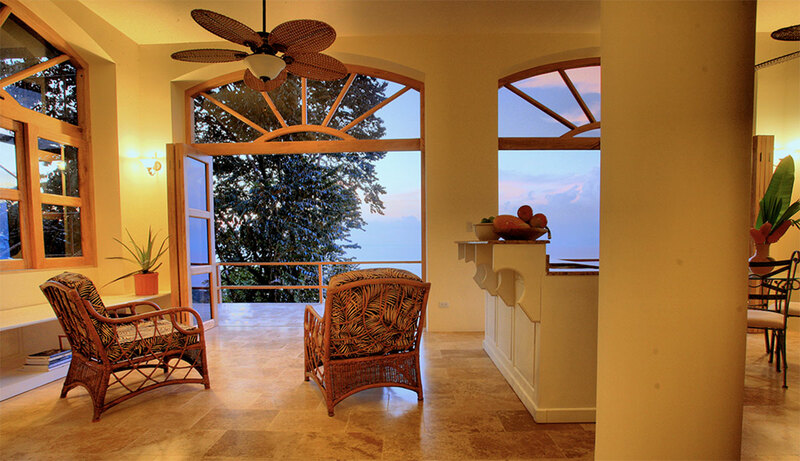 Villa Pacifica is a five-bedroom, five-bath home located on the Pavones Yoga Center property. The open kitchen/living/dining area downstairs is where students and guests often congregate to share and exchange life stories, myth, wisdom gained through experience, and laughter. Our chefs prepare meals onsite in the Villa Pacifica kitchen. Many students take home dozens of recipes because of this. At Villa Pacifica each room is equipped with its own bathroom (and yes, we have hot water). There are two large upstairs rooms with expansive ocean views where you can sometimes watch the surf from your bed. These rooms sleep up to four people. Downstairs there is one large room nestled into the jungle with a wrap-around porch and shower paved with river-rock. There are two smaller rooms which each fit two people. 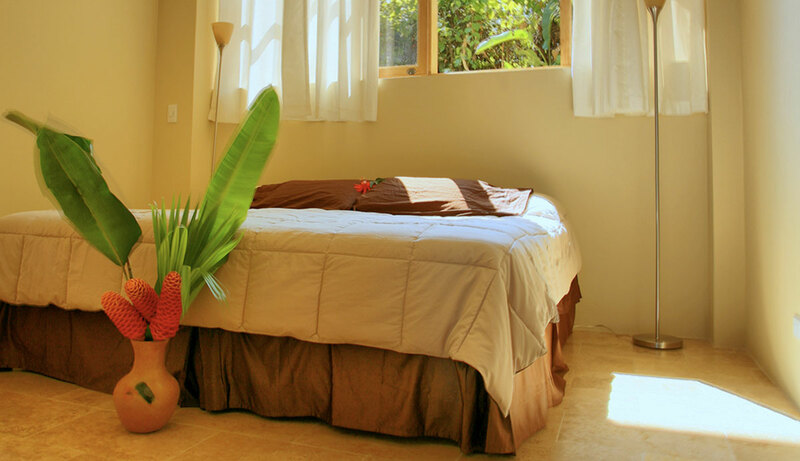 These rooms have private entrances and allow for a bit of seclusion amidst the shared group energy of Villa Pacifica. All rooms have either a king-sized bed with orthopedic mattress (for couples), or twin beds. All rooms have ceiling fans. Air conditioning is optional although most people find the ceiling fans and large wrap-around windows provide the perfect climate. Air conditioning is not provided during yoga teacher training programs except by prior arrangement upon registration (when you register for a private room you will need to request this at additional cost). The rooms at Pavones Yoga Center are not equipped with televisions, Wi-Fi, or telephones. We like to think of your time with us as a chance to unplug, to enter a period of digital-detox. Most people find that while the simplicity of life without modern technology may be challenging at first, there is a subtle and delicate quality of inner contentment and peace that permeates your time at Pavones Yoga Center. This is ultimately aided by slowing down to nature's schedule and living in a style that we have dubbed an eco-zen lifestyle.